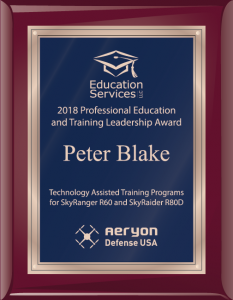 SALT LAKE CITY, UT, USA, March 13, 2019 /EINPresswire.com/ -- Education Services LLC3 is proud to recognize Peter Blake1 of Aeryon Defense USA2 with a 2018 Professional Education and Training Leadership Award for Technology Assisted Training Programs. Peter is being recognized for his vision and leadership in creation of the R60 SkyRanger and R80D SkyRaider pilot training programs. 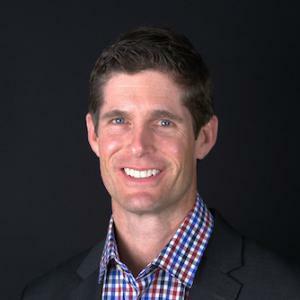 Over the past two years, Peter has overseen continuous evolution of this training from a fully in-person instructor-led experience to one that strategically leverages online technology to maximize efficacy, accessibility, and quality. Participants now complete much of their training online through a series of highly interactive “pre-learning” modules that consist of multi-media instruction, interactive learning and practice activities, guided practice pseudo-simulators, and use of the full Aeryon Mission Control Software simulator right from within their web browser. Instructors can monitor engagement of and easily communicate with each trainee and training group and are able to take the entire training program offline for use in the field where Internet connectivity is not available. For trainees, the experience is intuitive and personalized, including branding specific to the service branch or department the trainee is affiliated with. Micro-learning modules and a gamified user interface make it easy for participants to maintain situational awareness, with progress indicators clearly identifying the modules they have completed and those that remain outstanding. The training also serves as an on-demand review, available to past trainees who wish to brush up on the system or practice in the pseudo-simulators or full MCS simulator. 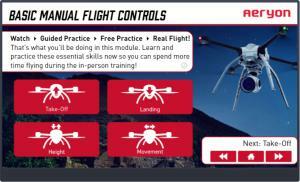 The online training system also includes support for instructors by housing training guides and classroom presentation materials, helping to ensure that all trainees benefit from a consistently high-quality experience whether they are trained directly by Aeryon Defense USA personnel, partners, or military trainers. Congratulations to Peter Blake and Aeryon Defense USA on this exceptional achievement! Peter Blake is the Director of Training and Customer Support at Aeryon Defense USA. He previously served as Director of Worldwide Client Solutions for Aeryon Labs, Director of Flight Operations and Client Services for Skycatch, and a dignified service record in the US Marine Corps including F-35B Program Lead for Marine Aircraft Group 13, Commanding Officer of Marine Attack Squadron 311, and as an AV-8B Harrier Pilot. He earned his MBA at Stanford and a BA in Government from Harvard University. Aeryon Defense USA, a U.S. defense contractor based in Denver, Colorado, delivers the next-generation of advanced sUAS to U.S. military forces and federal agencies. Led by Tom Jackson, a retired U.S. Marine Corps Officer, Aeryon Defense has assembled an agile and responsive team of proven military UAS experts who understand the current and future threat environment, and are equipped with the resources to deliver innovative solutions to meet the needs of defense and federal users.